Time to bring some life into our project. Let's change the properties of some of the components: their caption, color, size, font, and so on. And let's add just a little bit of code. Finally, I hear you sigh... isn't that all is programming about...? But C++ Builder is at least as much about components and their properties! In the Object Inspector you can change the properties of the components at design time. If you don't see the Object Inspector, open it with the menu: View / Tool Windows / Object Inspector (or press function key F11). Make sure that Form1 is selected in the Object Inpector, as shown in the picture above. 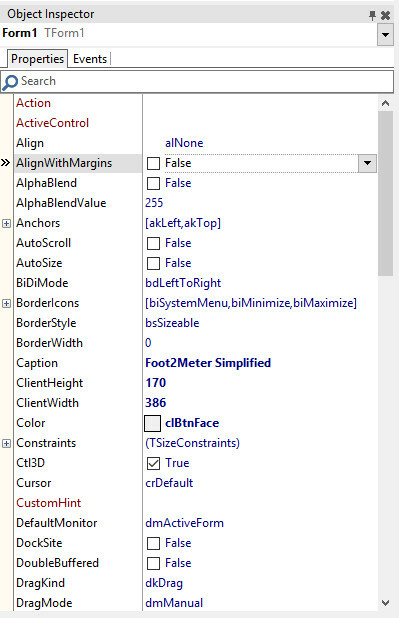 Click next to the Caption property and type: Foot2Meter Simplified. The text in the title bar of the "form" changes as you type. The names of our components are not very descriptive. Let's at least change the names of the components that will be used in the program's source code. That is, the components whose properties will be changed or used when the program is running. This assures that the program has a valid value to start working with. In the Object Inspector, you also indicate the events to which a component should respond. Double-click in the white field to the right of the OnClick event. C++ Builder will write btnFootToMeterClick into this field. That will be the name of the Event Handler, the function that is executed each time btnFootToMeter is clicked. Look in the Code Editor: automatically, an empty template for this Event Handler has been created. the property text of edInput is assigned to the property Caption of another label component. Stop the application and save the project (Save All).